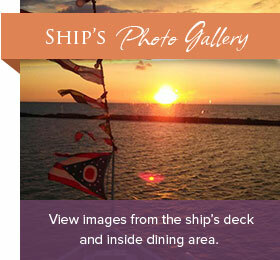 On the Nautica Queen, you’ll enjoy a delicious meal while cruising along Cleveland’s waterfront. All cruises include an unlimited buffet meal, coffee, tea or iced tea, and musical entertainment. We strongly recommend making advanced reservations as our cruise schedule is based on availability. To make your reservations, call 216.696.8888 or book online now. Pricing for children is age 11 and under. Cost per person does not include sales tax and service charge (cost in parentheses does include sales tax and service charge). Please note that prices and schedules subject to change without notice. Call for the latest rates, availability, and special event pricing. Parking is available in the FirstEnergy Powerhouse Parking lot. Parking prices can range from $3.00 – $15.00. The parking lot only accepts cash.